We asked Australia’s travel writers and tourism experts for their favourite places to visit around the world. These are their top destinations for a family nature escape in 2019. If you’re looking for something completely different to do with the kids on your next holiday, it’s hard to go past an African safari, especially for families seeking an adventure that’s off the beaten track. For me, Kenya is the ultimate safari destination – travelling through the unspoiled landscapes of the Masai Mara, which are teeming with wildlife, is guaranteed to broaden your family’s horizons. But it’s also important to keep in mind kids’ needs when booking your trip. It seems really obvious, but every camp offers different experiences and accommodation styles, so it’s worth giving some thought to the level of adventure your family is expecting beforehand. Will the kids enjoy a tented camp or find it a little too rustic? And, if your kids are younger, it might also be worth considering if the camp is fenced – although older children may enjoy hearing larger animals close by during the night, chances are smaller kids will find it a little scary. In terms of how long to visit, I generally recommend staying at two or three camps and lodges, three-plus days per camp. That allows plenty of time to get acclimatised and experience the full program of activities on offer, plus a little rest and relaxation in between. Squeezing in some culture is also a good idea, to give your kids a chance to immerse in local traditions and experiences. 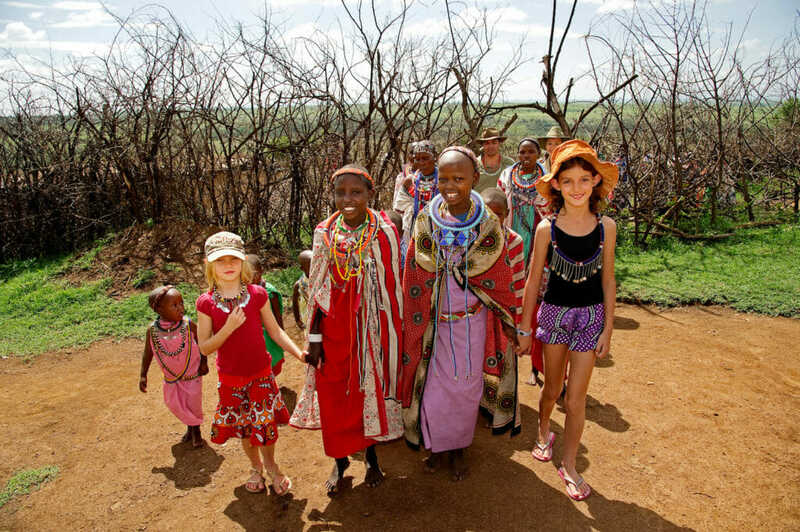 For example, at Sanctuary Olonana camp, a visit to the local Maasai village includes a variety of activities, from mock spear throwing and fire making to hut building and cattle herding. Some camps have a strict minimum age for safari, while others leave it up to parental discretion. At our camps and lodges, kids between 5 and 11 can go on regular game drives at the discretion of the lodge manager. Children under 5 also require the lodge manager’s permission, and their parents will need to book a private safari vehicle to ensure the comfort of both kids and other guests. While we all know how quickly kids can get bored of long car trips, game drives in safari vehicles seem to be an exception, and being car sick is not typically a problem. Don’t forget to bring along binoculars and a digital camera to capture every moment. Michael McCall is the Director of Sales Australia, New Zealand & Asia for Sanctuary Retreats and is a regular visitor to Africa. After working for a decade at Parks Victoria, you might assume I’d try something interstate for my holidays – but you’d be wrong! Australia’s second-smallest state offers so much when it comes to natural wonders, from stunning reefs and deserts to ancient rainforest and alpine peaks. 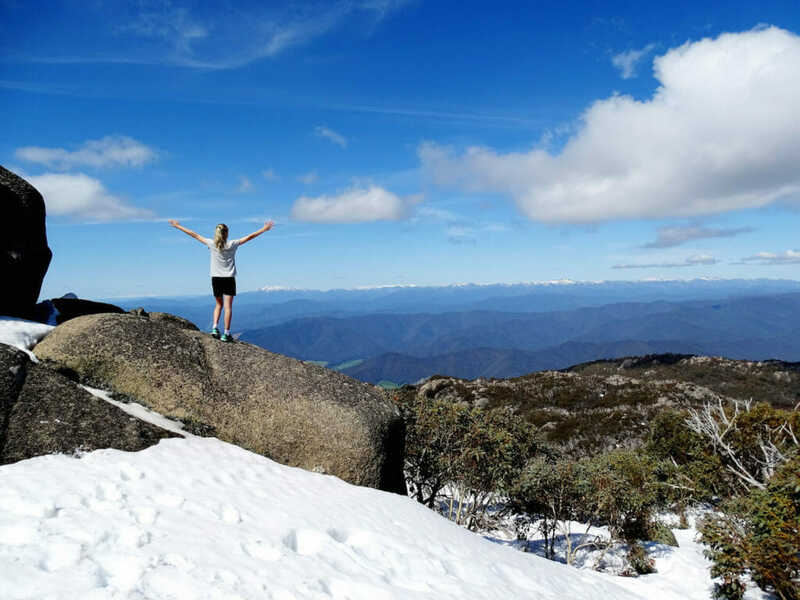 The peaks are my current outdoor obsession – there’s so much for a family to see and do in Victoria’s stunning alpine region. 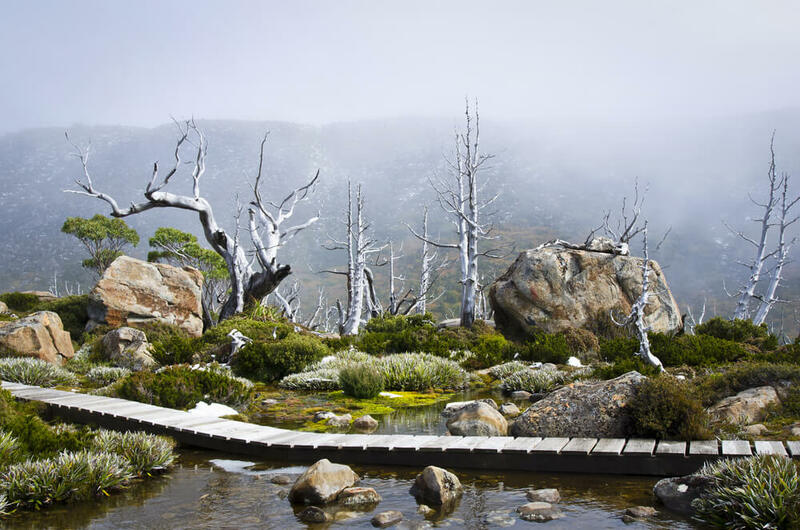 There’s Mount Buffalo National Park, bursting with drama off sheer cliffs and granite tours. Our kids love this rugged environment, where rock-hopping bush walks have them happily exploring without a grumble to be heard. After getting their fill of tumbling waterfalls, snow gums and stunning wildflowers, nights are spent around the campfire toasting marshmallows. When we really want to get away from it all, we head to Howqua Hills Historic Area. It’s a place that feels a million miles from anywhere, but which still offers communal campfires for those keen to make new friends. A favourite summer activity here is to jump on our inflatables and drift down the bubbling river in a family flotilla. If we’ve got time on our hands, we’ll head east to Buchan Caves. Those caves are something else! I can’t get enough of this underworld wonderland, where my kids are in awe of the spectacular limestone formations. Visiting last year, we were so happy to see a child who was unable to walk also enjoying the caves, with the help of a special stair wheelchair. And, of course, when holidaying in the mountains, we’ll continue our endless quest to visit all of the historic high-country huts that are dotted over the mountains. Each one is unique, and you can just imagine what life was like up here all those years ago. Although you could choose just one stop if you want the full experience of Victoria’s stunning alpine region, set aside a week in this beautiful part of the country. Tanya Smith works for Parks Victoria, which manages 4.1 million hectares of parks and reserves across Victoria, and 70 per cent of the coastline. 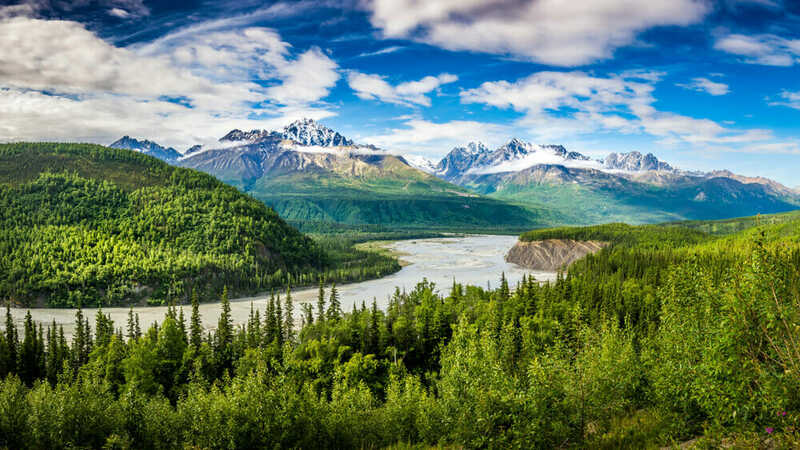 I adore Alaska – and with eight national parks and vast expanses of wilderness, it’s amazing for adventure-seeking families. America’s largest state (more than twice the size of New South Wales) is chock-full of outdoor adventures such as glacier tours, sea kayaking, bear viewing, flightseeing, fishing charters and Northern Lights viewing. The population is a mere 738,000, so there is ample space to play with nary a crowd to be seen. I’d certainly suggest you start your adventure in Anchorage, Alaska’s largest city. Learn about the state’s unique history and local cultures with visits to the Anchorage Museum, Alaska Native Heritage Center and Alaska Aviation Museum. Alaska Wildlife Conservation Center offers guided or independent tours to see bears, moose, wolves and wood bison in this conservation-minded facility. Then drive along the beautiful Turnagain Arm inlet to Alyeska Resort & Hotel for a few days of skiing and other winter adventures or fabulous hikes and mountain biking during the warmer months. Be sure to check out hiking and biking options in Chugach State Park and on trails along Turnagain Arm. I love driving in Alaska because there’s stunning beauty at every turn. I absolutely recommend you head out to smaller towns such as Homer (the Center for Alaskan Coastal Studies offers many adventures for families), Talkeetna (gateway to Denali State Park) and Seward (home to Alaska SeaLife Center and gateway to Kenai Fjords National Park). Or hop on internal flights to explore the coastline and myriad islands of the Inside Passage, including the town of Sitka. With fewer than 9000 people, it was once the state’s capital – and until 1867 was a part of Russia. First-time visitors with an independent nature should consider a day or more aboard the Alaska Marine Highway’s ferries. These ‘blue canoes’, as locals call them, cruise Alaska’s coastal waterways to more than 30 port communities and allow visitors to stay overnight for a real Alaskan adventure. Chez Chesak is an American travel writer who has lived all over the USA and visited almost every state. You can follow him on Instagram @chrischesak. When I first discovered Tasmania, I was hooked. The diversity of experiences and the ability to enjoy so much with our young family was just what we were seeking. There was one particular place that captured all of our hearts: Mt Field National Park. Located 90 minutes north-west of Hobart, Mt Field National Park is the start of the true Tasmanian wilderness. World Heritage-listed in 2013, it is Tasmania’s second oldest national park, and its icon, Russell Falls, featured on Australia’s first postage stamp. It’s steeped in history, but it’s still Tasmania’s best-kept secret (shhh!). We all loved watching the animals, from the huge docile possum that wandered into our camper to the eastern quolls scurrying around and the baby pademelons popping out of their mum’s pouch. Walks were easy for the family – our favourite took in three stunning waterfalls, walking through the rainforest, mossy logs and what can only be described as a fairyland of fungi. In the evening, the glow-worms lit up the walk near Russell Falls like little fairy lights under the ferns. Yes, we did have all three children believing in fairies by the end! Along the winding 16km dirt road past the Visitor Centre, we drove through the rainforest, through the glacial boulder fields, and stopped at Lake Dobson. The alpine environment around the lake wowed us even more as we wound our way along the Pandani Grove walk among the seven-foot-plus pandani plants that looked like something out of The Day of the Triffids (okay, I might be showing my age a little there). It was when we reached the top of the mountain (a 30-minute walk from the car park) that we were awestruck; the view from the top of Mt Mawson took our breath away. That was it – we didn’t want to leave, so we didn’t. Mt Field is now our home and the backyard for my three children. We live with endangered quolls in our roof, we play in the snow on Mt Mawson in winter, we experience the changing of the fagus in autumn, we BBQ and play plenty of soccer with the kids in the long summer twilight, and we delight in the new baby animals every spring. Mt Field National Park is a very special place that will give everyone in your family something to love. Rachel Power welcomes visitors to her cafe in Mt Field National Park and inspires them to explore beyond the waterfalls. Even before I became a mother, I knew what kind of family traveller I wanted to be. My husband and I enjoy nature and exploring the outdoors, and for us, travelling is about really getting to know a destination. Sure, we visit busy cities, but we also like to find spots that aren’t necessarily in the guidebooks. And we always take our time and stay a minimum of two nights wherever we go. We took our toddler daughter to New Zealand’s South Island this year, and all three of us fell in love. It’s such a great self-drive destination. You can stop whenever for cheese and wine (or, in our case, a snack and nappy changes) and the views are just out of this world. In Queenstown, we wandered along the cobblestone streets, queued up for arguably New Zealand’s best burger at Fergburger and took a gondola ride up high above Queenstown to the Skyline complex for spectacular views of Coronet Peak, The Remarkables mountain range and across Lake Wakatipu to Cecil and Walter Peaks. We drove one of the world’s most scenic routes, from Te Anau to Milford Sound. This was one of our trip highlights. I lost count how many times we stopped to soak up the views. When we got to Milford Sound, we continued with more views while cruising the fjord with Real Journeys. The rain was thrashing down while we were on the vessel, but it actually elevated the experience – the already gushing waterfalls crash down bigger and better, and new, smaller waterfalls emerge, cascading down from the sandstone cliffs. 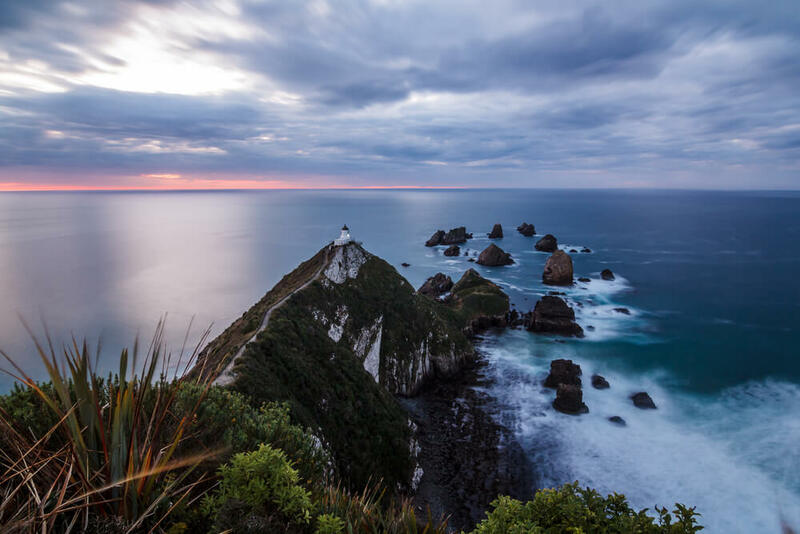 The Catlins in the southeastern corner of the South Island is an area that’s not at all overrun with tourists. Our daughter enjoys mimicking birds do she was in her happy place here. We went for short hikes, picnicked and drove around. There’s a lovely eco-resort here called Mohua Park, and it’s a true paradise – the kind of place you want to turn your phone off and just sit and stare out at the view of rolling green valleys while listening to sheep in melody. There are so many sheep in New Zealand that, by the end of our trip, our daughter was mimicking them too. What a treasure. Tatyana Leonov is the Editor of Family Travel magazine. She also contributes to a variety of travel publications. Visit her website for more. Need to catch up on the first two instalments of 2019 Top Destinations to Visit? Read about our top beach getaways here and discover the top destinations for food & culture lovers here.